Gwenny Griffiths (1867-1954). Griffiths was a British, 19th – 20th century, female artist born in Swansea. She was a painter of portraits and flowers. Griffiths was a pupil of Alphonse Legros in London and a student at the Académie Julian in Paris. She began to exhibit in 1892 in London, at Suffolk Street, and then regularly at the Royal Academy. 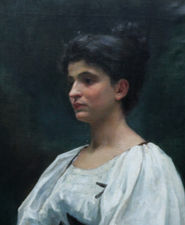 She also featured at the Salon de Paris in 1914, and sometimes exhibited at the Salon Nemzeti in Budapest.